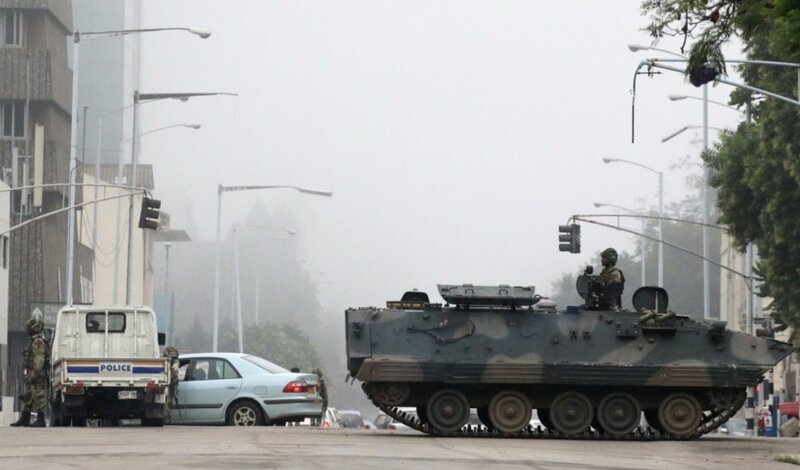 HARARE, Zimbabwe – Longtime president of Zimbabwe, Robert Mugabe, has been detained in bloodless transition and is safe, Zimbabwe’s ruling party says while denying ‘coup’ is being undertaken by the country’s military. Earlier today General Constantine Chiwenga took control of the main TV station in Harare, following threats that the military would take governmental matters in its own hands following Mugabe’s dismissal of Vice-President Emerson Mnangagwa, as reported by FRN. The MANU PF, the ruling party of Zimbabwe, Twitter account explained that Mugabe and his family had been detained while throwing their support for Mnangagwa for ruling the country. Last night the first family was detained and are safe, both for the constitution and the sanity of the nation this was necessary. Neither Zimbabwe nor ZANU are owned by Mugabe and his wife. Today begins a fresh new era and comrade Mnangagwa will help us achieve a better Zimbabwe. Fort Russ News will continue to report events as they unfold.